traveling to the west coast does wonders to your schedule…. rise and shine, 7:15am PST! here it is, basking in the glory of the foot. 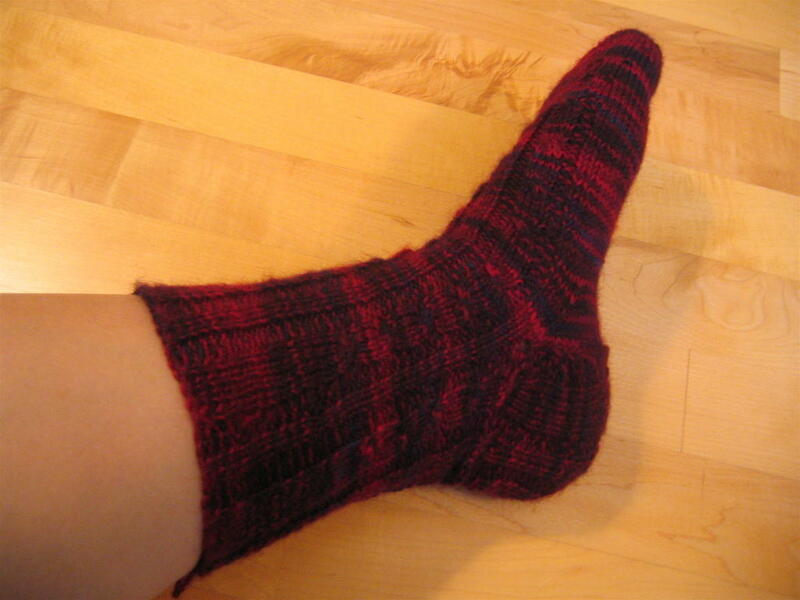 i managed to do the entire heel and instep on the plane, and finished up the 3″ (!) toe last night. wondrous discovery that DBF’s mother does a lot of crafting on her own, especially quilting, and more recently, knitting! (which means, of course, portland yarn store raidings! luckily, here they serve tasty libations along with the purveyed goods… stitch and sip, indeed…) so last night in the den it was a frame out of some tv movie, with the two women knitting (her on a baby blanket, me on a sock), the young man reading, and the father fiddling with the video camcorder. so classic. time: not that long. honestly, do i ever keep track? 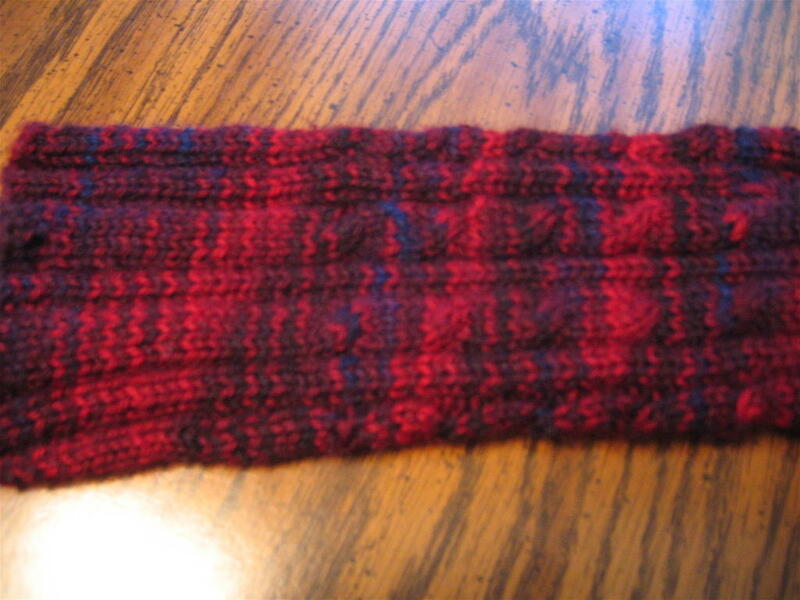 however, probably not more than 8-10 hours for the first sock. by the way, i am a total cable fiend, so these were a perfect first sock project. i am also particularly proud of the fact that i managed to do it without using cable needles, which more often than not can be a pain; perhaps the last thing i want to do while holding four small needles is hold another one. more photos below! 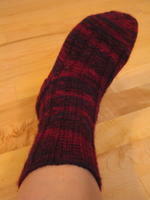 i can tell the heel and toe in the pattern are quite unorthodox, as far as i can tell. i never had to do a kitchener stitch (the toe is closed by merely pulling the yarn through the last remaining six stitches), and i didn’t have to use scrap yarn on the heel. the ‘heel flap’ features the decorative ribs going down the back of the foot, which is pretty awesome, though for some reason–either the pattern, or my slightly-off gauge–the bottom of the heel is sort of loose in comparison to the rest of the well-fitting sock (yay for ribs), but it’s kind of comfy in the padded-heel kind of way. you do this heel flap, and then pick up stitches along the sides to finish up the foot. also, since i was cruising on the plane and didnt really have room to try on my sock while i was knitting, i overshot about an inch on the foot and later, realised that i couldnt live with an extra inch. 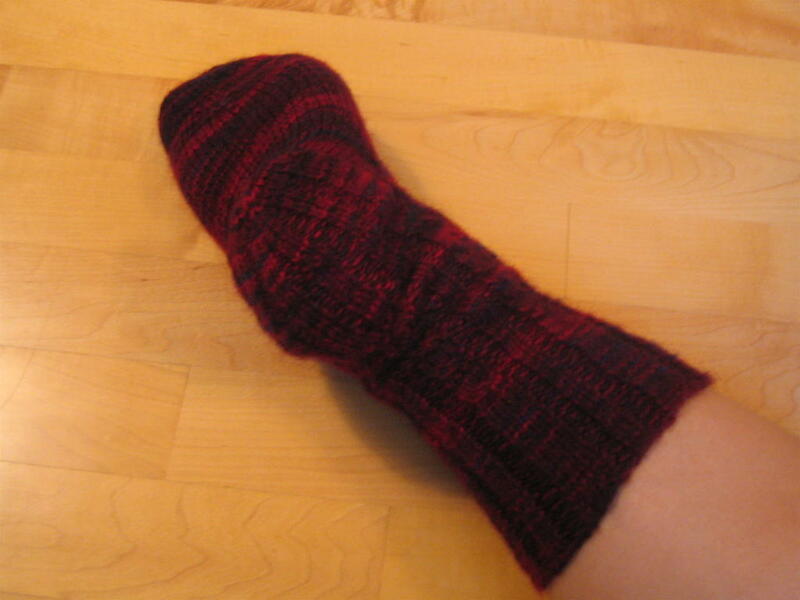 why knit socks if they’re going to be saggy? (why, indeed.) therefore, i had to do the ultra-scary thing of frogging completely live stitches, and praying that i wouldnt lose any teeny-tiny loops. i held my breath and reclaimed the stitches super-slowly, and was on the whole successful. still scary, but definitely doable. luckily, definitely gave me more confidence to rip out work in the future. anyway, i love my sock. #2 should be finished on the way back, i assume. and then the twain shall meet! >The sock is adorable, esp. on your foot! Your writing style is so fun to read–vivid and lifely. Thank you for generously bringing along the readers with you for many “front” seat rides in your multifaceted life. >Yummy yummy sock! Now I want to hear the story about how you got bumped up to first class. 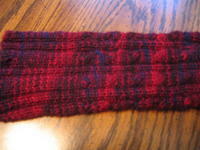 Now, did DBF tell you that his mother was a knitter before you got there, or was that a surprise? ?